. :: HM SULTAN QABOOS LAUNCHES HENRY DALLAL’S ‘DESERT SPLENDOR’ CAVALRY WORLD BOOK ::. His Majesty Sultan Qaboos Bin Said launched the book Ubahat Al Sahra’a or Desert Splendour at Al A’diyat City in the wilayat of A’Seeb after presiding over the Annual Royal Horse Race Festival. The book was prepared by English photographer Henry Dallal who has won a number of prestigious awards in the field of photography and book compilation. The book depicts the opulence of cavalry world at the Royal Cavalry and the beautiful horses it hosts. It also portrays the vitality of the daily work within it. The book includes vibrant pictures on the Royal festival for cavalry and camels. It also showcases the international participations of the Royal Cavalry including the performances in front of Buckingham Palace, Windsor Castle, and the performance known as ‘Beating Retreat’ on the occasion of Queen Elizabeth II’s Diamond Jubilee in 2012. The beauty of the Sultanate has received a good share in the book which reflects many rich aspects of the Omani culture and its traditions. It also depicts the lifestyles of Salalah’s green mountains and the horse races organised by the Royal Cavalry – whose role is not limited only to organising cavalry festival and races but also to encouraging and instilling the love for horses and preserving Oman’s rich history and culture. The book, which is of 352 pages, was designed by Terry Jevons and printed in Italy. The development of cavalry in the Sultanate of Oman is attributed to the thought of His Majesty Sultan Qaboos Bin Said and HM’s keenness to inculcate the love and appreciation of the Omani heritage and culture in Omani minds – including their relations with horses, since the dawn of the blessed Renaissance. 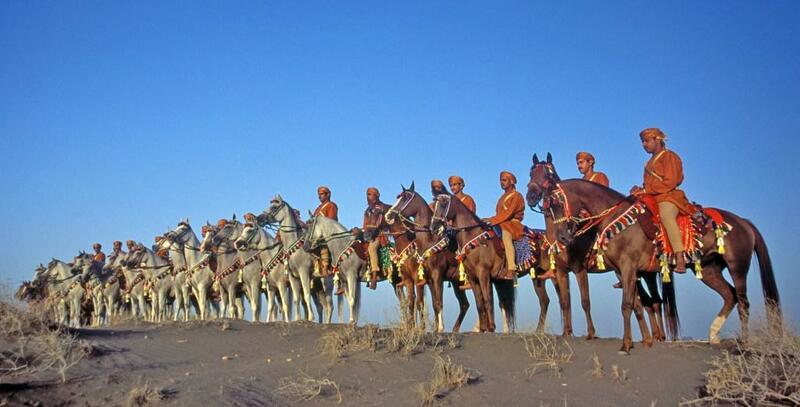 Dallal spent six years taking photographs of the Royal Cavalry horses and the Sultanate’s horses in general. He then selected the best and printed them in high quality version that matches reality. “This book is one of the best books that have been prepared till date,” Henry Dallal said. The book is one of a series of photography books, taken and developed by Henry Dallal including Horse Warrior and Pageantry & Performances.